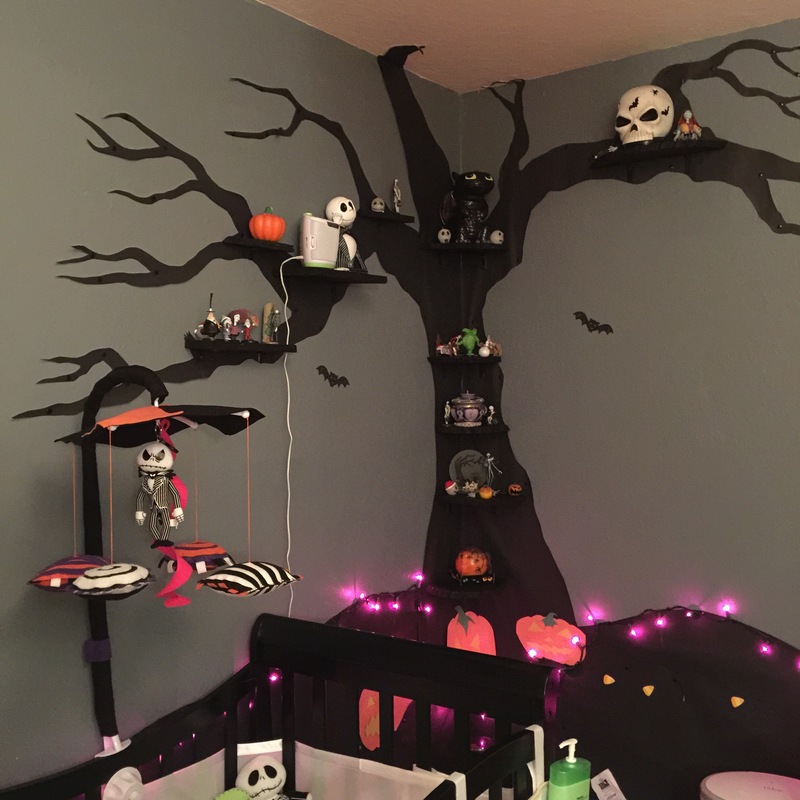 »crafts»Nightmare Before Christmas Nursery on a Budget! 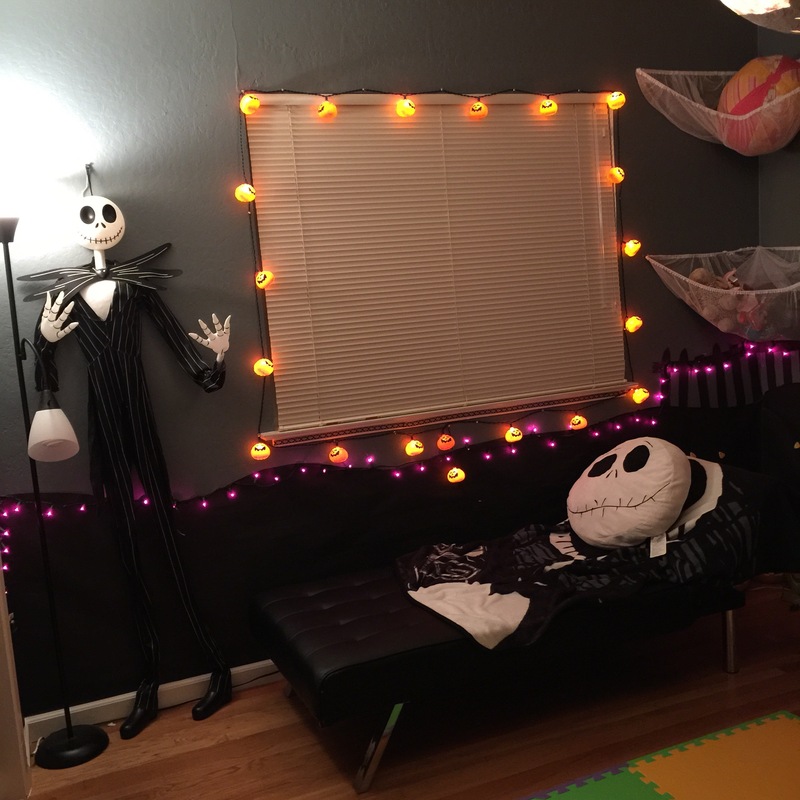 Nightmare Before Christmas Nursery on a Budget! 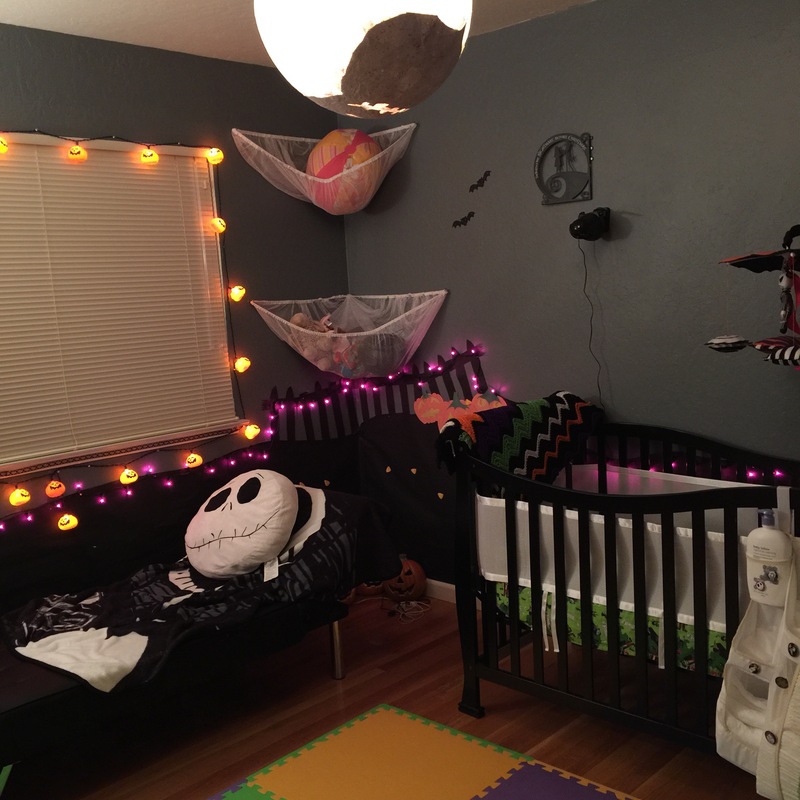 There are Halloween toys in those “spiderweb” nets, and if you look closely, light-up pumpkins on the floor in the corner. Changing table was a freebie, found and painted up with new orange ceramic pumpkin knobs. 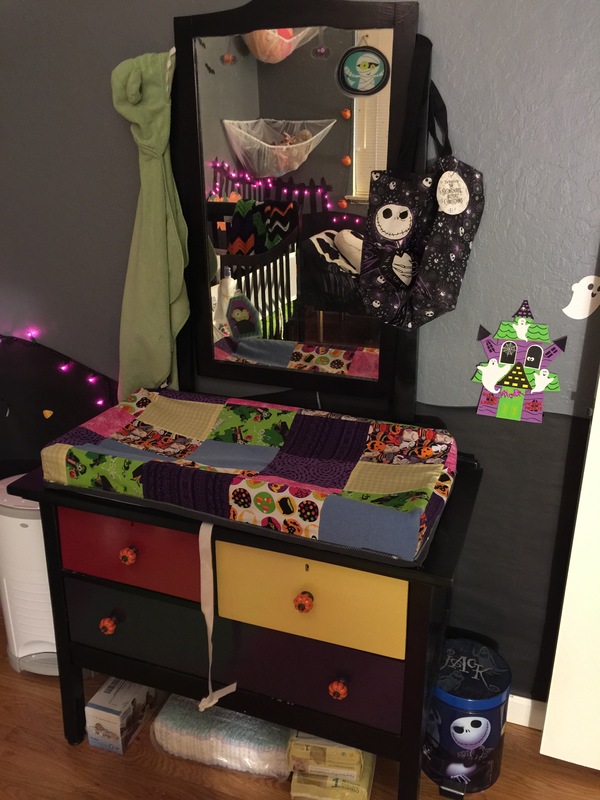 The changing pad was made from fabric scraps I had left over from making a few halloween themed crib sheets. The haunted houses in the mural come from the dollar store, the bat stickers from Michaels. 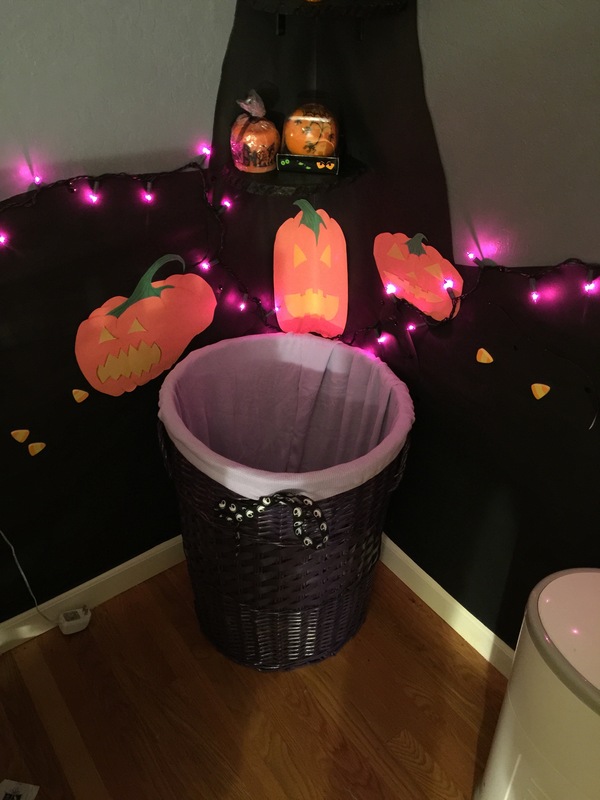 The laundry hamper is a basket purchased from a local thrift store that I upcycled with The remaining spray paint from the changing table redo. It is lined with a linen bag made from a scrap of fabric, tied with two Nightmare shoelaces I was given and sewed together into a tie. 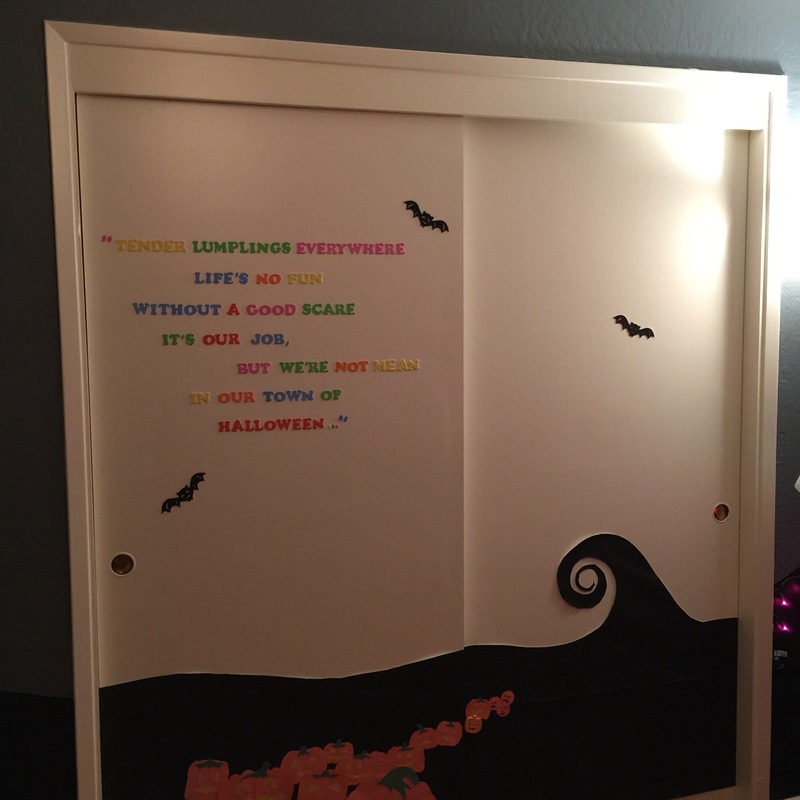 The words to the song “This is Halloween” in foam letter stickers. The mural is entirely made of paper. I bought four rolls of black bulletin board paper at Michaels and cut it into the hill-scape. The pumpkin patch is made of construction paper. This way the entire thing can be moved, torn down, altered, etc, with no harm to the walls. Ideal for renters. A more expensive but more sturdy options would be black contact paper used like wall paper. In another room of my home, I used contact papers of different colors to create “stickers” that I applied to the base of the wall. It was a cheap and durable way to make the small space tie in with my towels and decorative items. A similar technique could be pieced together here. The tree is made of paper also. I drew the tree in small-scale on a piece of graph paper, then sized up by drawing a grid on the back of the black paper and duplicating the tiny tree exactly, square by square. This could easily be done with a printed picture of a tree, if you’re not a freehand drawing type person . The shelves are raw wood slices painted black; they were found at Joann’s and cut into quadrants to make “corner” shelves. The Nightmare Before Christmas figurines are all entirely second-hand. The mobile was made by a friend out of felt, creating little geometric shapes in a similar color scheme, and assembled over a standard mobile kit we got on eBay for $9. Crib was found on Amazon, and was a lucky score with its unusual wavy line. I believe it was less than $200. We all remember the famous introduction to Oogie Boogie as he drifts across the moon singing “I am the shadow on the moon at night…” I made this paper mâché globe using a punching balloon and tissue paper. 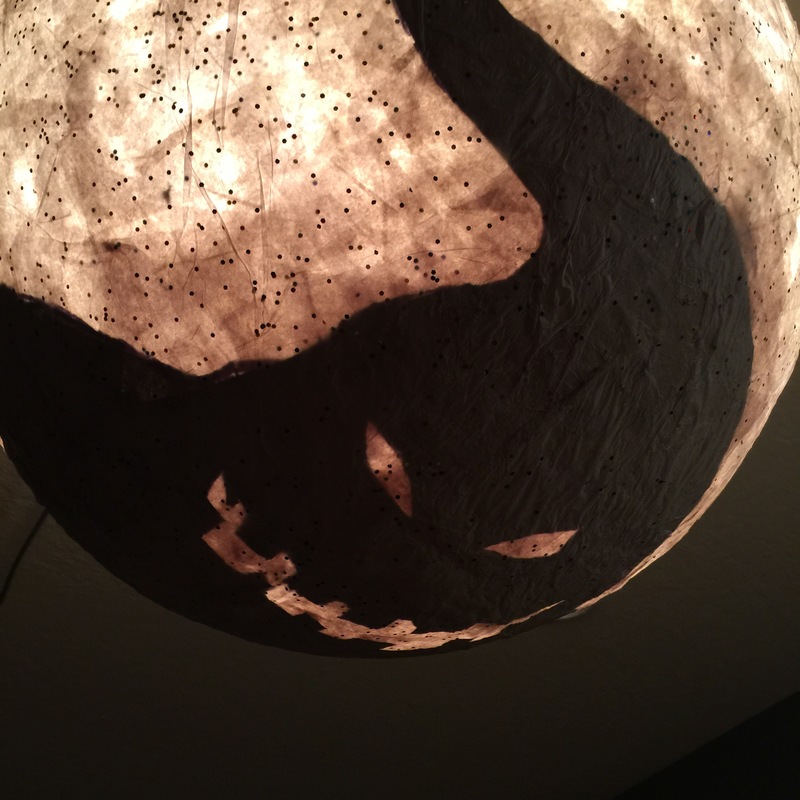 When the white speckled globe was finished, I drew an outline of Oogie onto the globe and then filled in the color with black tissue, then papered over that with more white. When the light is on, Oogie is visible, but when the light is off, it’s just a moon. This fits over a standard hanging bulb fixture I found at ikea. Dresser bought second hand on Craigslist I could have painted it too, but it was in good condition, and I wanted the closet to seem built in, so I opted to leave it white, thought it would be easy to swap out the pulls for more pumpkin knobs in any color. It is topped with flexible flocked trees ideal for hanging jewelry, ribbons, bows, etc. pumpkin jar for random pins, clips, and rubber bands; this and the goblet purchased at thrift stores around Halloween. Baby clothes purchased in giant lots on eBay, by age and size. All these like-new baby clothes gotten for a total of $128. Average cost per clothing item: $.30. I mention this because babies grow fast, and they need constant changing. You need lots of little onesies, but since they grow out of them so quickly, what is the point in buying new? My friends and family gave me plenty of cool clothes new, so I supplemented with carefully chosen second-hand lots. Themed rooms are not as difficult as they seem, and honestly, you don’t even really need to be artistic. The main rule is that all the decorative items should also be useful & useful items decorative. The pumpkins are night lights. That skull up in the tree casts shapes up on the ceiling and spins. All the purely decorative elements are up on the walls where they do not crowd the space or take up storage room. Every useful element has been tweaked slightly or multi-purposed. 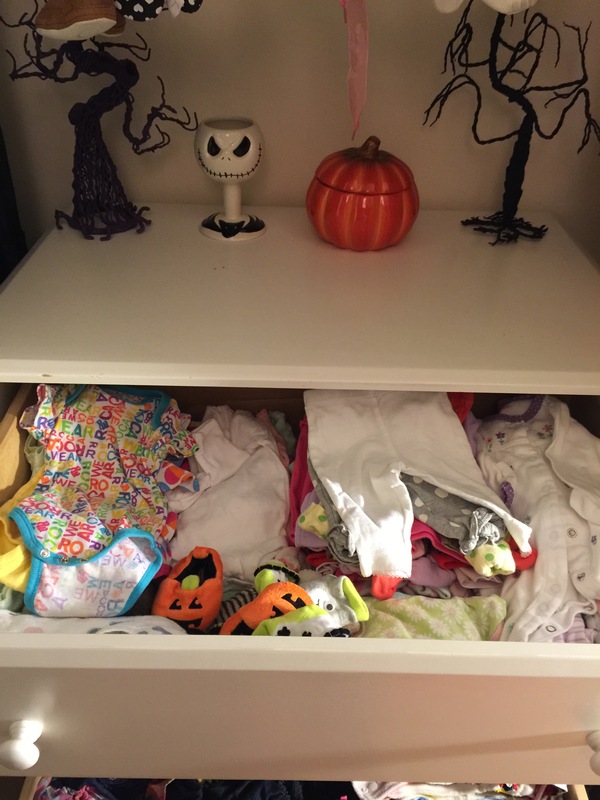 The changing table was originally pale yellow and purple. I sanded it lightly and spray painted it, applying new knobs I found on eBay. Even the diaper caddy has Nightmare buttons on it. The switch plates are Halloween themed, and even the clock, bought on eBay used, is a collectors piece. How? Start with the furniture. Know which pieces you need and think of interesting ways to make them fit the theme, from paint like Rub n’ Restore, to slip covers, washi tape, hand made bedding etc. Next, move to the larger accessories like lamps and shelves. Fit these to the theme. Then move to the walls. Now that you’ve “seen” the room, imagine what you can do with the walls. Draw the room as you have envisioned it on graph paper. Color it in, Try some wall colors, think about how permanent you want this to be. Wall elements can be useful. In an outdoor garden themed room, I saw a white latice used as a headboard, and decorated with the child’s stuffed animals on curtain hooks. It was adorable, and silk ivy wound up through it. Useful and decorative. The tree in this room was meant to be a purely decorative element used to house all the other decorations, and tie the space together. You could easily do a character via transfer to a piece of paper, pieced vinyl, or painted on the wall using a projected image that is then traced and painted in. When you have all these things, fill In with all the knickknacks. Thrift stores are great places for theme related items, because people often give them as gifts, they sit on a shelf, and then are given away to Goodwill. I have a pig-themed bathroom decorated with pig figurines found almost entirely at thrift stores almost brand new. Bottom line: you can achieve an adorable room for a very cheap cost with a little creative energy and frugal shopping. You don’t need a decorator. You don’t need to be a cookie cutter mom. You don’t need to spend a lot on licensed items. 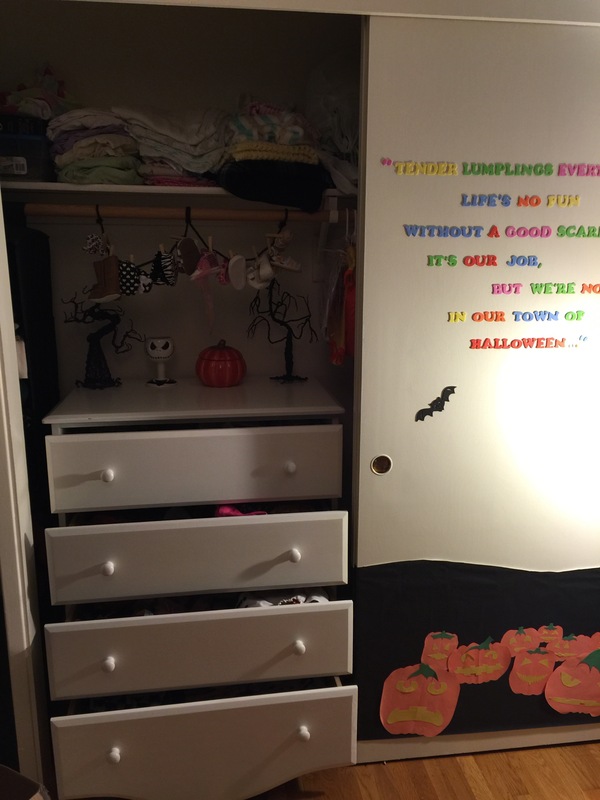 A few pieces to establish that this is not just a Halloween room but a Nightmare room is all you need! You can personalize to any child, any fandom. Just think carefully and scroll Pinterest for inspiration. You’re just getting the juices flowing, not looking for things to copy. Great work! Love it A lot!